Every year I look at these photos, taken outside of Guadalajara a few years ago when AdRi and I traveled to Mexico for Day of the Dead, among other things. I look at them every year to be reminded of the love and intent it takes to create an altar like this. 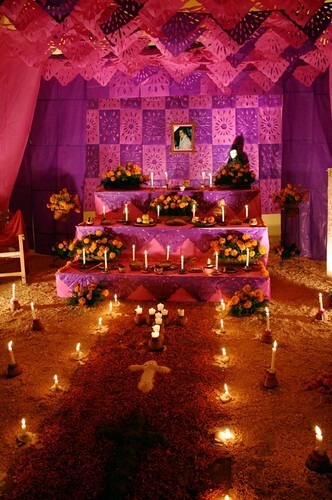 An altar that is only for a day or two, completely built in remembrance of someone loved and lost. 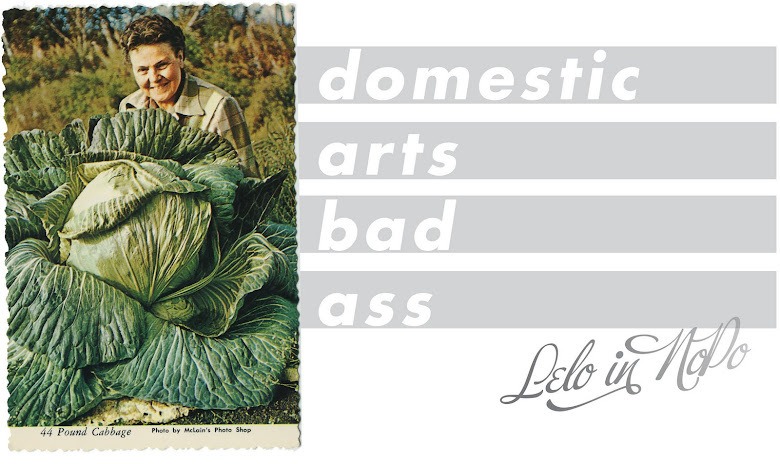 Art is a powerful thing and something that is a constant thread in my life. Temporary art fascinates me. 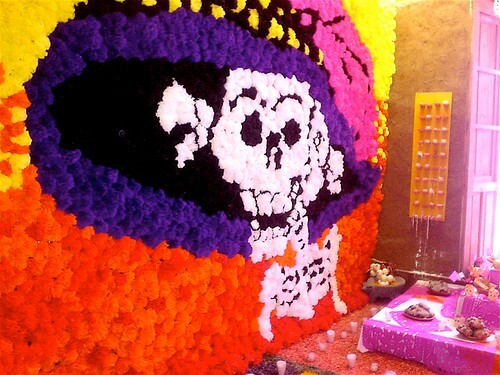 The hours and work of placing flower petals in shapes and patterns on the floor, using rice, beans and grains to create floor murals, cut paper (papel picado) crafted and hung covering entire walls, and each piece at the altar representative of something loved by the one who has passed away. That is love. That is art. And these inspire. 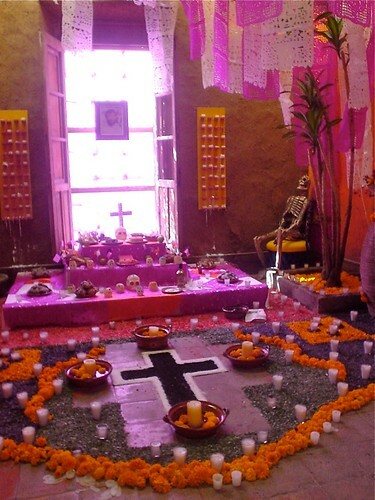 Happy Day of the Dead to you. I hope you find some love and inspiration in art and remembrance tonight. Perhaps, at least you can leave a glass of water out for the dead. You see, their journey back to this world is a long one, and they need to drink something. If not water, a nice shot of tequila will do just fine, too. I had never heard about the glass of water. Although my parents would definitely prefer wine .... may just have to do that. thank you for sharing these. they are lovely and colorful. and the city of guadaljara is great. i need to go again to see more of it. it was great to get a flavor for the energy of the city. The colors! I needed this today, thank you!